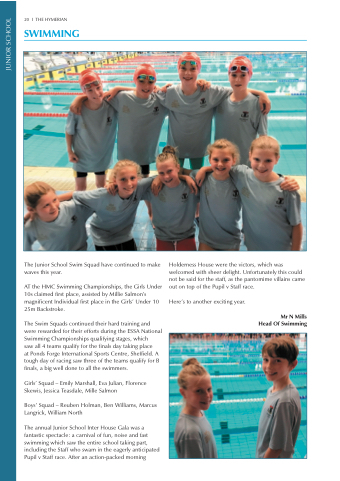 The Junior School Swim Squad have continued to make waves this year. AT the HMC Swimming Championships, the Girls Under 10s claimed first place, assisted by Millie Salmon’s magnificent Individual first place in the Girls’ Under 10 25m Backstroke. at Ponds Forge International Sports Centre, Sheffield. A tough day of racing saw three of the teams qualify for B finals, a big well done to all the swimmers. Holderness House were the victors, which was welcomed with sheer delight. Unfortunately this could not be said for the staff, as the pantomime villains came out on top of the Pupil v Staff race. Here’s to another exciting year.